Are you guilty of using your customer’s stinky old data and mail lists for email or print-to-mail campaigns? I hope not! As a printer or marketer, you need to set the highest standards when working on customer campaigns. If data doesn’t pass the smell test, take the steps below to help customers establish a regular process of cleaning and maintaining their lists. 1. Create a list of best practices and share it with your customers. Don’t just email them a link and hope they will read it. They need something they can look at every time they update their data. I get asked the same questions over and over about list hygiene, formats, opt-outs and spam, etc. Put this info on one sheet, laminate it, and present it to your customer. 2. Don’t be a pushover when customers don’t want to work on their data. Here’s an example: I have a client who is in the financial services business. She sends monthly printed postcards by U.S. mail and also sends out a monthly email newsletter. Last month she sent me her list. We printed it out, looked it over for typos and fixed them, mapped the fields, merged and purged, and made everything clean and good smelling. The mailings went off without a hitch. However, this month she said she didn’t have time to work on her list and could we use the last one? As printers and marketers, we have to get uncomfortable sometimes and make customers unhappy. You can’t go down that slippery slope. One month of bad habits leads to two which leads to six. I have horror stories where I broke my own rules and did mailings from lists of indeterminate age and origins. It is never worth it. Walk away. Just say no. After 25 years of handling customer data, I can tell you that you or your customer must make it a habit to update your list EVERY TIME you plan to use it. 3. Give customers the facts about data and its shelf life. Your postal customer council and the USPS have helpful statistics to drive the point home on the importance of list maintenance. Mail addresses go bad at the rate of 3 to 10% per month. I know, that’s a high number! This is what’s happening: people move, people close their P.O. boxes or abandon them, people change their names, and people die. A professional mailing company or your in-house mail department can update much of this for your customer, but the most current info comes straight from your customer and their relationship to the people on their list.If they consult your laminated checklist each time they prepare their list, they will remember all the things that can change between mailings and why it’s so important. 4. Clean email lists, too! Email addresses go bad. People change jobs, they have multiple email addresses, they tend to sign up for things repeatedly (often under different email addresses), and email recipients move out of your geographic area or leave the industry you are marketing into. Your recipient may give you a soft signal. The signal is that they don’t want to receive your emails anymore. I do a newsletter for a thought leader whose personal contact list includes high-profile recipients across many industries, government, publications, and associations. Sometimes a person will reply to his email and use some verbiage that sounds like they are too polite to unsubscribe but they aren’t loving the experience. So we gave them the gracious reply, “It sounds like you are really busy right now and our newsletter may not be a good fit at this time. How about we remove your name for now, and if you want to join again later when the timing is better, you can use this link?” People are so grateful, and it saves them the embarrassment of unsubscribing. You certainly want to take care of that before the next time you do an emailing. List info can come in through various routes. Like the folks in the example above, there are folks who don’t like to use the unsubscribe button inside the email. Instead, they will click reply and specifically asked to be removed. Or, they’ll send a text or private message. Collect all those messages and preferably consolidate them. When I get messages on behalf of clients, I print them out and file them with the list info. Remove that recipient immediately, while it’s top of mind. Back up your data. Your email service will take care of the recipients who click to unsubscribe or report you for spam. I recommend adding all opt-outs and spam reporters to their own external list (not inside the email service). If you switch email service providers or your current provider has a technical issue (it happens) you have a current, clean list with documentation. You should always have the most current version of your data backed up to your own server. Have a plan for soft and hard bounces. You’ve probably seen reports from your email service provider that list the soft and hard bounces. You can read the Help section of your email provider website to learn about what that means. However, if you repeatedly send to a person whose receiving server doesn’t want to receive your emails, this can affect your “reputation” with your service provider. I advise my clients to remove email addresses that bounce. You can usually send to a soft bounce recipient a few times and hope things improve, but they rarely do. Don’t try to chase people down and try to get them to accommodate you or change their settings. Just keep things clean and tidy, and everyone will be happier. Now you can see why printing companies and marketing service providers must be role models and set high standards when it comes to how data is maintained and prepared. Update your list before mailing or emailing. Use best practices for list hygiene. Promptly take care of personal requests to be removed. Thank people for their kindness if they notify you in person or in a personal email. Rise above hurt feelings and promptly remove anyone who does not wish to receive your mail. Handle customer data with the care and respect it deserves. Please share this post with the people in your company who manage the data for your print and marketing customers. I’d love to connect with them on LinkedIn and get feedback on their tips. I do a lot of presentations on this topic, and I like to give examples from the trenches. P.S. Printers and marketers, one last note. I recommend you become a member of your local Postal Customer Council or attend their events. Even if you don’t do mailings for customers in-house, this organization will keep you informed about USPS promotions, introduce you to professional mailers in your area, and keep you updated about best practices. If you’re not sure if your area has a group, contact your postmaster. If there’s not a group in your area, it’s worth traveling to attend a meeting, conference or tour. I also recommend touring your local post office and meeting all the postmasters in your area. Every post office has its own flavor, and you will get insight into what a difference a clean list can make! Sandy Hubbard is a growth strategist and marketing advisor for printing companies. She works with you to build business growth programs that can be sustained over the long haul, with affordable tools and your own people…without stress! 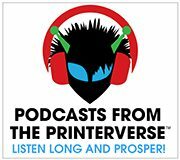 Find @sandyhubbard on Twitter every Wednesday at 4 PM ET, assisting #PrintChat host Deborah Corn @PrintMediaCentr with a lively online discussion for printers and those who love print.